Existing home data this morning shows we have now risen to an 8.9 month supply of homes on the market. (3.99 million) This means at current sales pace, if no additional homes were listed for sale, then it would take 8.9 months for all the homes to sell. A healthy market has a 4-6 month supply of homes for sale. Morgan Stanley recently estimated there are 5 million homes in the shadow inventory. These are homes in default that the banks are (currently) holding off the market. This was also the final month that will show sales juiced by the home buyer tax credit. Look for the July sales number released next month to be a blood bath. Less homes coming off the market. 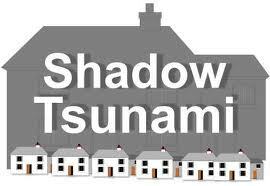 A tsunami of shadow homes flooding the market. But have no fear, Helicopter Benjamin Bernanke said today he now has plans to buy additional mortgages if necessary. I guess he could just buy all 8.9 million homes soon to be on the market. This afternoon Ron Paul told Ben Bernanke that the Federal Reserve and the US Government have spent $3.7 trillion over the past two years to try and stimulate the economy. He mentioned that with that amount of money they could have sent a check for $434,000 to every unemployed person in the country. Instead the money stays at the top, and the size of the hungry and poor population continues to grow. A society structured this way has only ended one way, and it is not a pretty sight. The news in the market today is centered around Bernanke's testimony to Congress. He discussed the ominous economic data that he is receiving, (I discussed this data last week in Looking Under The Surface and Another Peak Under The Surface) and his comments sent the stock market sharply lower. More importantly, he said he stands ready to battle the next downturn (using endless waves of printed dollars) should the economic data continue to underperform. This is the scenario I anticipate for the second half of the year. Assets across the board will fall as the economy continues its downward spiral. This will provide a buying opportunity for investors before Bernanke enters the market with helicopter force. His next round of Quantitative Easing (money printing) will be the catalyst for gold and silver's next explosion upward. As home builder confidence fell sharply earlier in the week we found out why today. Housing starts came in dreadful this morning at 549,000 on an expectation of 575,000. This is bad news for our bubble economy short term, which depends heavily on construction related jobs. It is very good news for our economy long term because the last thing we need is additional supply with approximately 12 million distressed homes that are for sale now or coming soon from the shadow inventory. The earnings numbers have been disappointing across the board as Muhamod El Erian from PIMCO explained this morning on CNBC. The worry has come from total revenue (top line) which is the true measure of business growth. As I've talked about in the past, the problem with the current economic recovery will be the final demand for goods that needs to come from the consumer. As businesses have restocked their shelves it has boosted the economy but no one has shown up to purchase the goods. And speaking of PIMCO, last month they released their US Commercial Real Estate Project, which is the best report I've read this year for the direction of the commercial market. They interviewed hundreds of people in multiple cities across the country to get real information on the health/outlook for the market. "The greatest trick the devil ever pulled, was convincing the world he didn't exist." Many believe the United States has 15-20 years before the day of reckoning. Others watch every auction thinking this could be the one. Before I go further let me explain what default means. In a normal environment (Greece) a country would default if no one shows up to purchase their debt at auction. They can no longer roll over the existing debt they owe. They would have to declare bankruptcy and then pay out some percentage to lenders based on their current tax receipts. The United States today has the reserve currency of the world. This means that most transactions around the world are completed in dollars, which has been a huge boost to the US economy for decades. Why? Because it has allowed us to borrow far more money than would otherwise be possible. This borrowing has boosted the economy year after year. Think of if you took out an extra $20,000 on your credit card every year to take vacations and buy things. This would be a nice boost to your lifestyle. We also have a Federal Reserve here in America which means a formal default (discussed above) is extremely unlikely. If there was ever a time when the US could not raise debt from the public or foreign countries, the Federal Reserve stands ready to purchase an unlimited amount of debt. Americans for the past 12 months have been taking their money out of stock mutual funds and putting it into bond mutual funds. A large portion of those bonds are US treasuries. (US government debt) This has created what is called domestic savings. The Federal Reserve has allowed commercial banks to borrow hundreds of billions of dollars at 0% interest to help heal their balance sheets after the credit crisis. The banks have not lent this money out to businesses or real estate, they have lent this money to the Federal government. They have become the second major buyer of debt. It is also a great situation for the banks; borrow at 0% from the Fed and collect 4% from the government in interest. This week we received the Treasury International Capital (TIC) report that shows what foreign countries are purchasing our debt and how much they are buying. The money to fund our spending for years has come from China and Japan. They are export oriented countries that run a massive trade surplus, giving them extra money every year to invest. They have always put their money back into America because it has always been considered safe and because it keeps the value of their currencies artificially lower, thus helping their exports. Things have changed, however, over the past 18 months and this most recent report was no different. China dumped $33 billion treasuries in the month of May (the data is released two months in arrears) and Japan offloaded $9 billion. They are now net sellers. So the obvious question is, if they are selling, who is buying? It is the UK. They purchased $28 billion in the month of May and their US debt holdings have risen from $180 billion in December to $350 billion in the month of May. Their holdings are now growing exponentially. Here is the secret to the optical illusion: The UK has no money. They are currently in a debt crisis similar to Spain and Portugal. They have no ability to purchase $170 billion of US debt over 6 months, they can barely pay their own bills and are in the process of an austerity program. We know this buyer is not China purchasing debt through the UK, and we also know it is not hedge funds. Hedge funds make their purchases through offshore accounts in Caribbean banking centers which saw an increase of $14 billion in treasuries in the month of May. The buyer is the Federal Reserve. Can you now see the full picture? The Federal Reserve is printing money and giving it to commercial banks at 0%, who then are lending the money to the US government. They are also purchasing the debt through the UK to stay hidden from the public eye. The United States is not 15 years away from its informal default, it is happening today, right in front of us. You only need a trained eye to see the illusion. Warren Buffett made news this week when it was discovered he was reading a book titled "When Money Dies", a book about Wiemar Germany and their hyperinflation in the early 1920's. One of the most fascinating parts about that period is that the Germans had no idea they were on the verge of hyperinflation just weeks before it arrived. In fact, it was a consensus that they were in a deep deflation because the economy was so bad. Behind the scenes, however, their central bank was secretly printing money to purchase debt to pay for war reparations. The hyperinflation arrived in an instant, like someone turning on a light, when it was discovered what the government was doing. This is why it is crucial to keep a portion of your wealth in precious metals today as insurance. (At least 10%) Then take the time to study history, study what is happening in the world today, and make your own decision on if you should purchase more. The United States debt default will be the most important news event of this decade, and possibly this century, as it will reshape the world around us. I will continue to provide real time information on this topic as it develops.